Faith Community Nurse Blog - Green Leafy Vegetables - What are they good for? Green Leafy Vegetables - What are they good for? Green Leafy Vegetables -What are they good for? Collard greens - packed with Vitamin C & K and high in fiber. Kale - a potent anti-oxidant and cancer-fighting properties. Spinach - packed with Vitamin K & B and good for a healthy blood-pressure. Arugula - packed with Calcium. Romain - great source of Vitamin C & K and Beta-carotene. 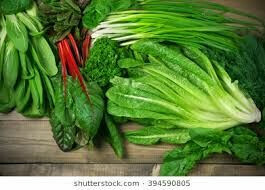 To make sure we keep these wonderful green leafy vegetables safe, we need to remember to buy organic if possible, keep greens away from raw meats, keep cold and always wash our hands prior to handling fresh greens.